After trying this save twice on FM 16 here and here, we're back to give it a shot for FM17. The premise is simple. We're going to take the worst team in San Marino, San Giovanni, and attempt to take them - and, just as importantly, the national side - as high up in the world as we can. One catch - we're not going to be buying any players. We're doing this purely with the talent that we can find and nurture in San Marino. 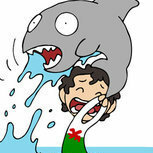 My love affair with San Marino started when I saw how the English media reacted to any qualifier against the minnows. It's a guarantee that before every game, one or two 'journalists' would complain about England having to even waste their time against San Marino, who didn't deserve to be gracing the same pitch as England. Well, excuse my French, but that's bulls***. They're a country. They deserve respect. They're going to get it. It's time to tear down the establishment. So, what's changed from last year? Well, not a whole lot. I still expect this to be an impossible challenge that'll take an absolute age to get anywhere with, but I'm insane enough to try it. There will be a few differences, though, both to the save and the way these posts are written. The only difference (at least the only one that I can think of) with the save is that the in-game editor is going to be turned ON. I'm not editing anything. The only reason the editor is turned on is to look at things under the hood - look, not edit, With Youth Recruitment acting funnily, I want to take a peek at things like reputation and finances for other teams. I'm not going to be looking at anything that will give me an unfair advantage, which means no taking a look at the CA/PA of any of our players (I might take a butchers at some of the other teams in San Marino though). I love the way @ManUtd1 writes his updates, in particular. I'm not going anywhere near that level of craziness (sorry! ), but I'm going to try and include some more stuff to immerse you in the game world. We'll have to wait and see what that entails. Bare in mind I like to use NSFW language (although I usually bleep it out), have some wacky ideas and a dark sense of humour - you've been warned! That also means trying to take advantage of every little thing to give an edge. We need it. I'm going to spend a lot of time on set pieces, in particular. We also got lazy with player development. I'd go on holiday for six months and forget all about tutoring and player development - two vital components of the save. I'm going to try and do a better job in that regard. I think that's everything, although it's probably not. If I remember anything else different, I'll add it here. If I don't forget. Which I will. Dominant! - Go unbeaten in a league season. 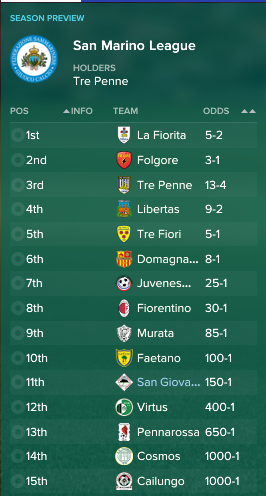 Achieved 20/4/2030 - 17 wins, 3 draws, 0 defeats. Here to stay - Make the Europa League groups. Achieved 26/8/2031 - Lost 3-2 to Sparta Prague in the CL Playoff. 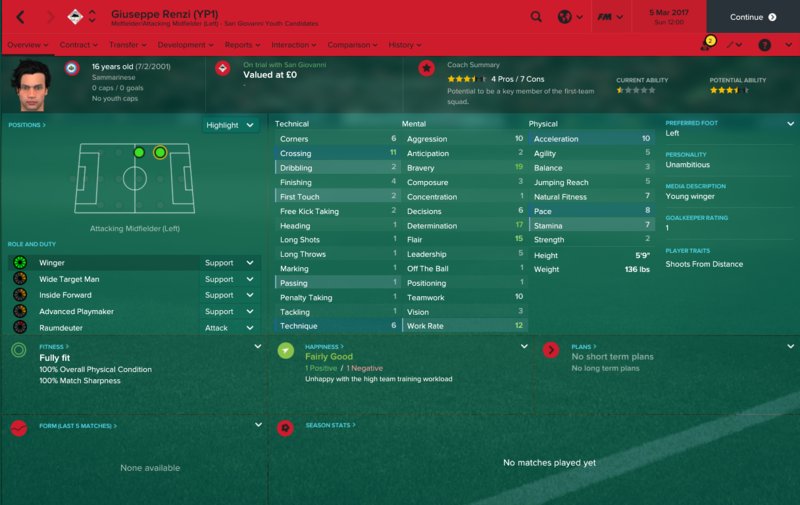 Name recognition - Make the top 100 leagues reputation wise. Achieved 16/6/2034 - 100th. Household names - Be a top 200 ranked club. Achieved 16/6/2034 - 179th. Mr Reliable - Have a player become the record capholder for San Marino. Achieved (at some point around 2093) - Andrea Muraccini (YP72a), 159 caps. The next Andy Selva - Have a player become the new record goalscorer for San Marino. 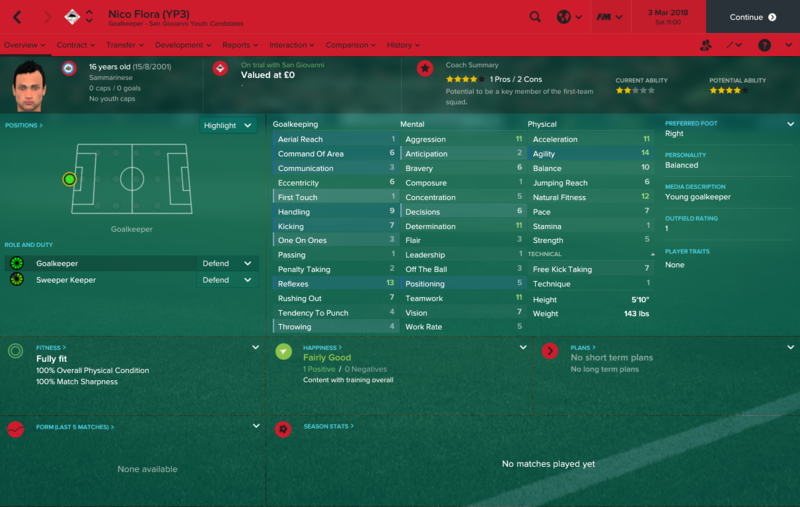 Achieved in 2065 - Claudio Berardi, 41 goals. I figure this might be a nice touch, considering how many generations this save is likely to span. We'll be putting in players for the San Giovanni Hall of Fame here, alongside their achievements. Awful facilities, as expected, although I'm very surprised we're predicted 6th. Actually, never mind, that's 6th in our group of 8, not out of the 15 total clubs. No point posting a picture of the stadium, because we don't have a 'home' ground - we groundshare depending on availability like every club in the country (AFAIK). 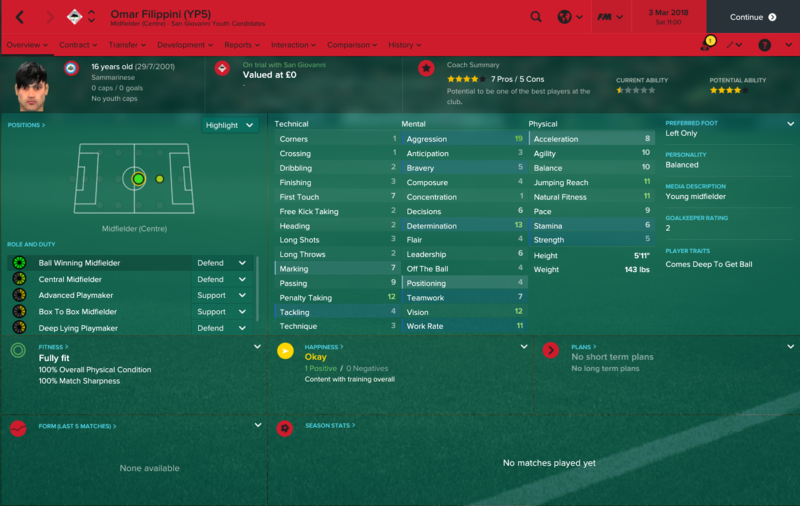 Purely judging by our assistant (who has 3 JPA/4 JPP), our two best players are CBs, then two wingers, three strikers, a keeper and two more strikers. Not much call for CMs in San Giovanni, it seems. Here's the best player. He actually looks very tidy for this level, but 1 determination? If we go 1-0 down he's already pulling the bus change out of his pocket. Om nom nom, in for the ride! The shout-out is much appreciated, and I can't wait to see the dark insanity that you cook up! YES! I am so excited for this. Yeeees!! 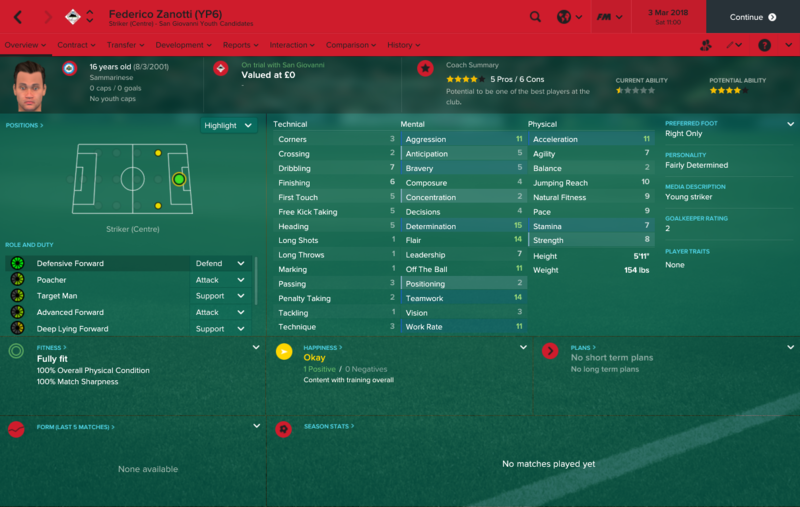 I was waiting for this since the release of FM17! Get them this time, you deserve it! Marco Falconelli looked at his watch. 11:58. He sighed. It didn't look like anyone else was coming. He shouldn't have been surprised. San Giovanni announce a new volunteer manager? Who cares? He'd heard a rumour that this time might be different. It's an interesting story, after all - a 20 year old Englishman who can't speak Italian finds himself in San Marino managing a football team. Rumours, he laughed. Can't trust them. He would know, after all, being a journalist. Well, a sort of journalist. Falconelli was the idea behind the Sammarinese Football Chronicle. It was his baby. Every week, he'd work tirelessly to report on all the footballing activity inside San Marino after his hours at the factory were done. He hated that place. But something needed to pay the bills. Hell, the paper was costing him money. He sold each copy for 20 cents. He was lucky if he made more than €2 a week in sales. The demand just wasn't there. He took a long drag on his cigarette and peered at his watch again. 12:03. S***. He was late. Still, it's not as if an interview can go ahead without any journalists. "What'd you mean you don't have your translator here?" Falconelli was tempted to punch a hole through the wall of the hotel room. After a few minutes of conversation in woeful English and even worse Italian, Falconelli worked out that Sewell didn't even have his translator around. He was sick, apparently. Falconelli knew the feeling. For a moment, he wondered why he was bothering. Then he brightened again. No problem, Falconelli thought, loading a translation app on his phone. What is the English for 'duck-sized horses', he wondered? About an hour later, Falconelli emerged in the car park outside the hotel. He wasn't happy. Not only did he not get a clear answer on just how Sewell had ended up here, but most of his answers translated so loosely that Falconelli was going to have to make educated guesses as to what he was actually trying to say. Still, he could make it work. He'd dealt with worse before. He glanced down at his watch. Late for work at the factory. Oh, f*** it. Here's the deal. We're s***. The squad's average passing ability is 4.21. We're not going to try anything fancy. Instead, we're taking a page out of Charles Reep's book. Charles Reep could be considered the first ever football analyst. Born in 1904, the former RAF man would take notes at games using pencil and paper, coding events by shorthand. In total, he probably attended - and notated - more than 2,200 games in his life, including 50 pages of drawings for the 1958 WC final. In those 2,200 games, Reep discovered a tendency - the more passes a team made, the less likely that they were to score in that move. Only two in every nine goals came after a move with 3 or more passes, and so Reep theorized that the quicker a team got the ball into the opposing penalty area, and the less time they spent on the ball, the more goals they were likely to score. Here's the issue - Reep was later proven wrong. His route one belief had failed to take into account a lot of variables. So, why are we basing our tactic off of a football analyst proven wrong in everything he thought about the game? Well, it's simple. For us, Reep may well be right. We're absolutely hopeless on the ball. The more time we have on the ball, the more likely we are to make a mistake. Likewise, the more time the other team have the ball, the more likely they are to slip up. If we get the ball and punt it away from our goal, they're less likely to score. That sounds pretty good to me. We're getting the ball, and we're using Reep's tactic of GET IT FORWARD. Reep was also a big advocate of pressing and forcing the other team to make a mistake - our players stamina is woeful, but the other teams are going to be hopeless on the ball, so it's worth a try. Will it work? I have no idea. I'm interested to find out, though. 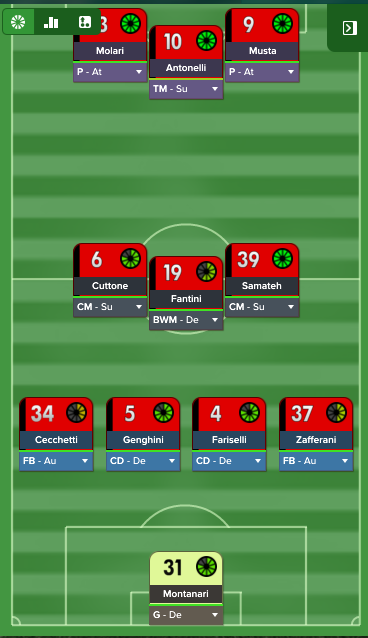 It's nice to try a tactic that relies on both teams being hopeless. And so it begins again... . Happy to see this start up again! I've enjoyed having the editor loaded with my Avenir Beggen save just to peek around. Cheers! It's going to be interesting to see what's lurking away out of sight, that's for sure. Late for work at the factory. Oh, f*** it. Those bottle openers with the Pope's face ("p-openers") don't make themselves, Marco. 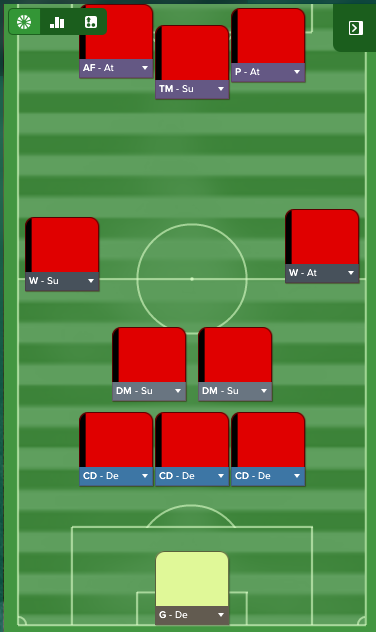 It's nice to try a tactic that relies on both teams being hopeless. 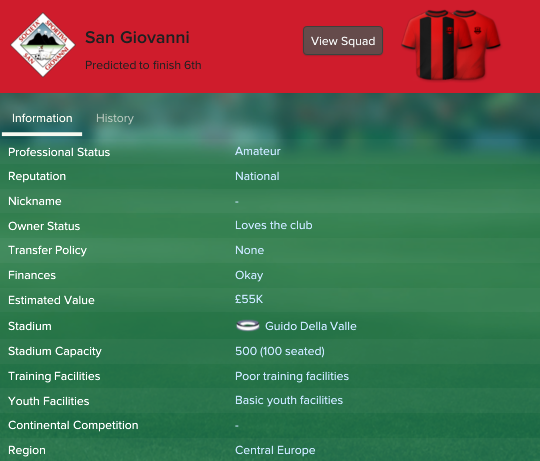 Now, this San Giovanni team should be more stacked than last time! As for this theme, "Make San Marino Great Again!" I will be following! Glad to see this challenge back, good luck mate! 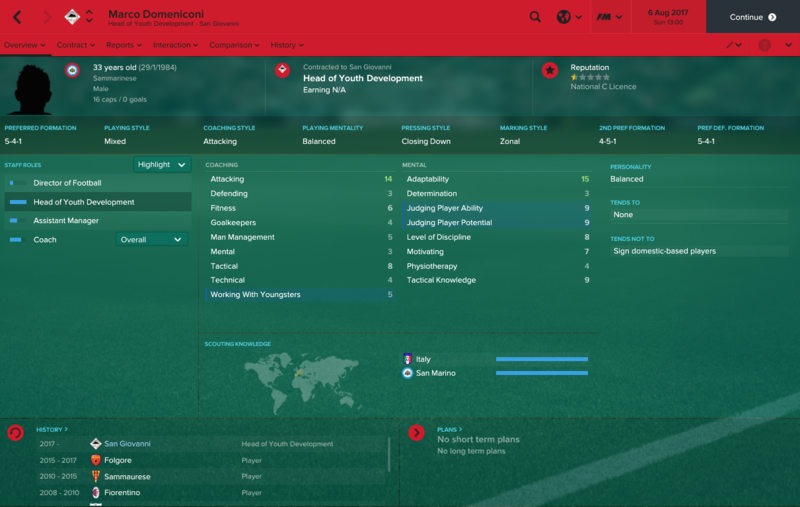 I saw the thread about youth recruitment, did you reach any conclusion? Any word from someone at SI? They're still looking at it. I imagine it would take a while to find anything, and I'd be really surprised if the bug - if it is a bug - was patched before FM 18. It's nice to see this back as I really enjoyed reading last year's threads. Good luck Jamie! Welcome back to San Marino. This would have been absolutely perfect if he skied it. Brilliant to see this back! I knew we'd be awful at football, but this is something else. The tactic isn't actually faring too badly - we're creating lots of good chances - but we don't have enough quality in the side to actually convert those chances, or keep the goals out at the other end. That's... a little bit of a let down, to be honest. The best prospect is an unambitious winger with 2 dribbling and 1 passing. Welcome to San Marino! He could become a tidy CB. We were predicted to finish 6th, and ended up coming 5th on GD. Pretty much par for the course. We got knocked out in the groups, although it's nice to see that the actual cup winner gets a Europa Qualifying spot this year. We're crying out for a striker who can actually finish and a defender who can actually defend. To be honest, though, we're weak everywhere. It's a bit frustrating that none of our youth intake are anywhere near ready for first team football, though. Other Teams: Tre Penne lost 4-2 in the CL First Qualifying Round to Flora from Estonia, La Florita lost 5-0 to Videoton from Hungary and Folgore lost 7-0 to KGHM Zaglebie from Poland in the EL First Qualifying Round. Next year: I don't expect to be making the playoffs next year, to be honest. 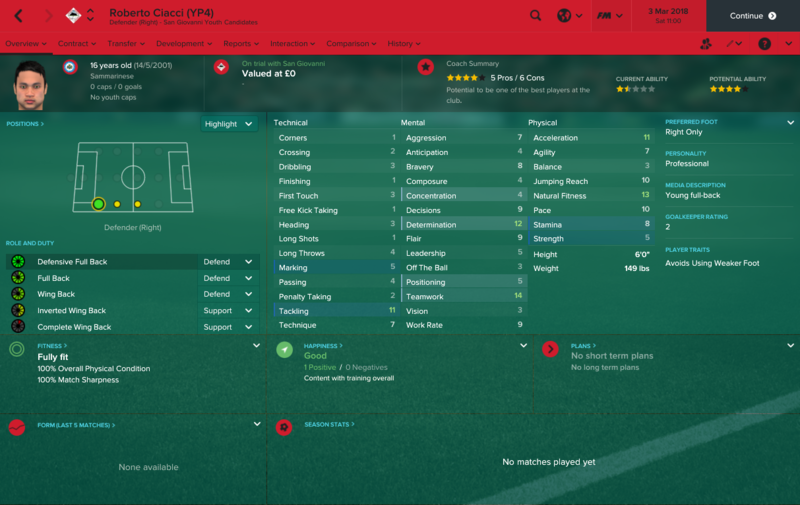 We didn't improve enough in the youth intake. 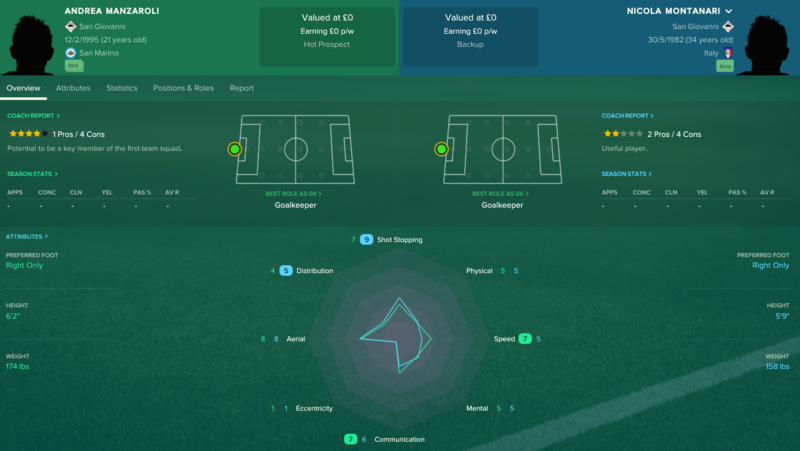 So using the in-game editor, I've found something interesting - after just the first season, Cailungo have had their Youth Recruitment level dropped from 3 to 2. Everyone else's is the same as it was at the start. I'm not sure what (if anything) that means, but it's interesting anyway. 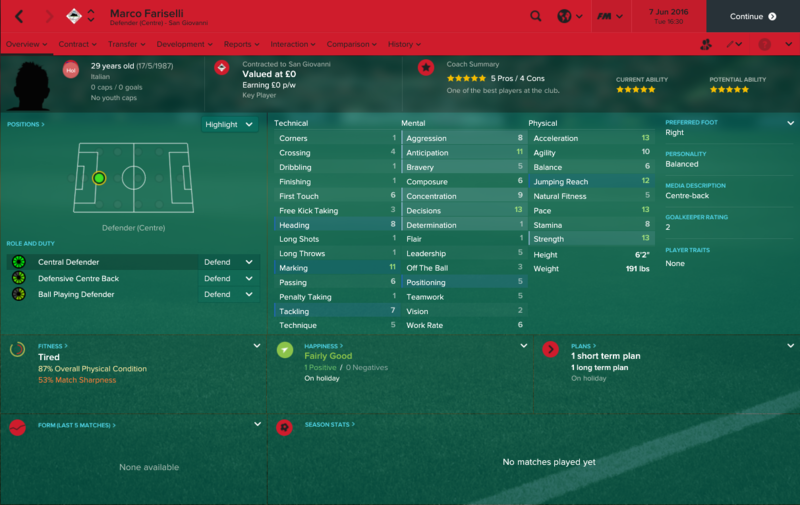 He's a 5'10 GK with 1 aerial ability and 3 one on ones. Hmm. We needed a RB, and we got a good one here. 11 tackling, decent pace and a professional personality. He's going to be important for us, I feel. Filippini could potentially grow into a tidy CM. Decent stats combined with a pretty good personality. Me likey.